The Pic of the Week for February 3, 2017 comes from a random vintage (1908) used postcard that I found in large lot on eBay. We are having a fine time. There seems to be a lot to see down here. "Do they miss me at home?" Who is Mrs. G. Garretson? What is she doing in Washing D.C.? Who are the "we" she is traveling with? Why is her question about being missed at home in quotation marks? Is this an inside joke or reference between the two women? A quick search of the ancestry.com database showed many Garretsons in New Brunswick New Jersey at the time. There was a "Grace" Garretson listed in the 1910 census in that city. She was listed as a 19 year old daughter living with her parents. As an unmarried young woman, it would seem usual to be addressed as a "Mrs." so that is probably not her. More digging might turn up some some evidence, but with so little to go on we can only speculate. Speculating and imagining though is a main point of this exercise. I did learn one new piece of information after examining this postcard. I was not sure what the "R.F.D. No. 2" meant in the address. It stands for Rural Free Delivery, "a service which began in the United States in the late 19th century, to deliver mail directly to rural farm families." 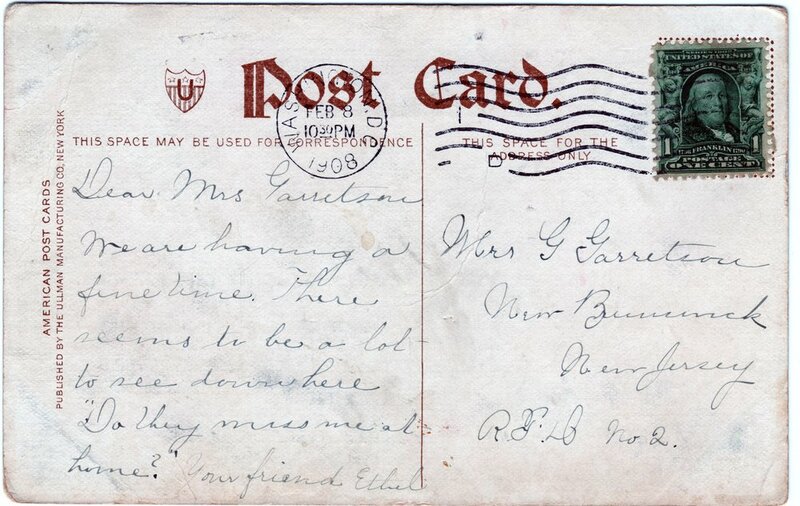 Next time you are at an estate auction, garage sale, or flea market look for the oldest used postcard you can find. Reflect on it like I have done for the one above. What did you learn? How did you feel? What else do you want to know? I would love to know what you come up with. Feel free to share it with me at info@psychogenealogist.com. I might just use it for a future blog post. Thank you! Check you inbox for a conformation email. Tagged: Pic of Week, postcard, 1908, Washington D.C.